This is Scott and Randy's Duct Tape Camper. 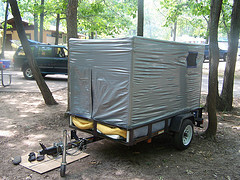 We built our camper in August 2008, and first used it on a camping trip the weekend of August 16. Enjoy the photos along with our story, and be sure to check out the construction videos below. The camper has also received a bit of press lately, including a brief story on national TV, so be sure to check out the media page. And if you want a good laugh, check out what people are saying about us and the camper in some forum discussions.